Hitting your big power goals just got a little bit easier with the CorkSport Crashbar and optional 23.5”x11”x3” front mount intercooler. 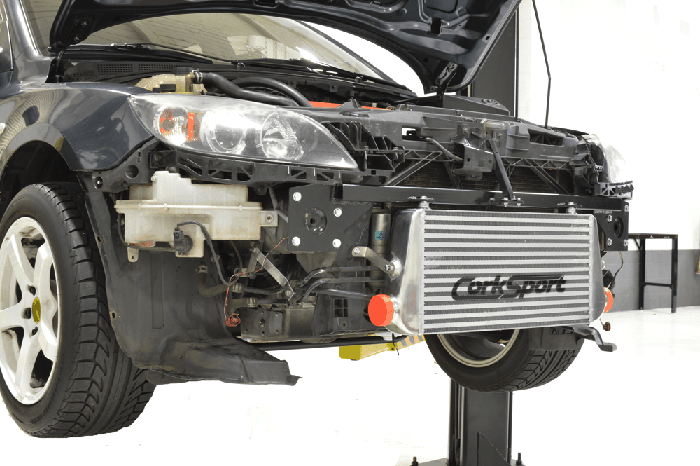 Featuring a durable powder coated steel construction and room for as much intercooler as you need, the CorkSport Crashbar eliminates the difficult custom fabrication and welding. As long as you have a reciprocating saw, a drill, and some patience, you will be able to install the crashbar. Check out the full details down below. We designed the GEN1 MS3 CorkSport Crashbar to be installed and fit with as little permanent modification as possible. Due to the nature of the modification, this is still an extensive install that requires cutting off the OE crashbar and drilling holes to mount the new crashbar. But that is where the difficulties end. No designing, welding, or bending required. All components are made out of 0.188” thick 1020 steel that is laser cut, professionally welded, and powder coated. Each crash bar is then checked for high-quality welds, good powder coat, and accurate dimensions to ensure it will last as long as the rest of your Speed3. There are minimal sacrifices when installing the CorkSport Crashbar. OE tow hook location, fog lights, and all other features are not affected by the install. You even retain support for the OE hood latch. There is adjustability for the Intercooler built into the crash bar as well for the best possible bumper fitment. The optional FMIC is a 23.5”x11”x3” unit with 10mm runners. It has proven itself on a 550whp car with no issues. 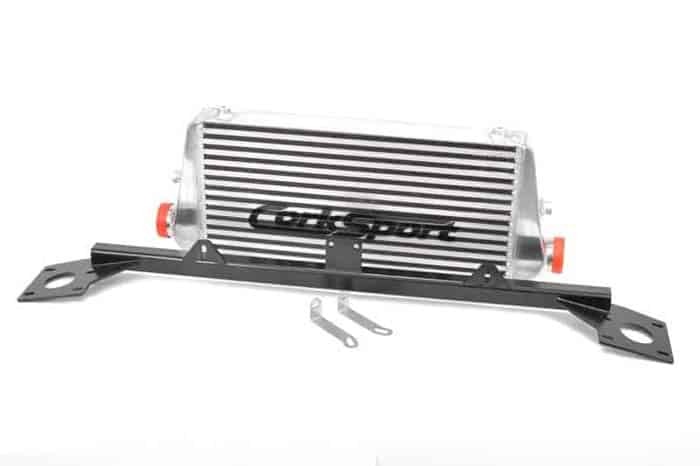 We highly recommend this FMIC as the CorkSport Crashbar was designed to fit this intercooler specifically. The brackets welded to the crashbar precisely match the mounting points on the intercooler for a quick and easy install. 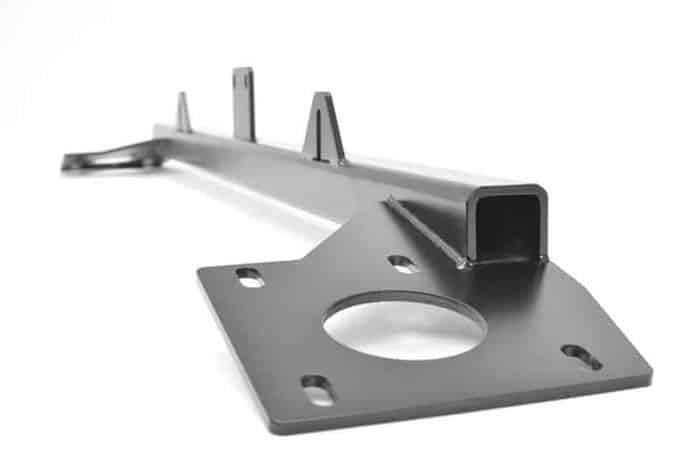 Stainless steel brackets are also included with the FMIC to attach the intercooler’s side mounting locations to existing holes in the radiator core support. The CorkSport Crashbar and FMIC combo will even work with our existing GEN1 FMIC piping kit. This modification requires cutting and drilling. The end result is a more or less permanent modification. Do not attempt unless completely confident in your abilities and are fully committed to using this crashbar. Crashbar has not been tested for DOT crash safety and is for offroad use only. Crashbar has not been tested with other FMIC or piping kits. Other brackets or modification may be required to use with other FMIC and piping kit options. 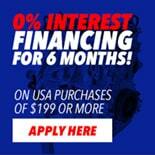 After installation, a tune is highly recommended to ensure that your engine is running correctly after the FMIC upgrade. 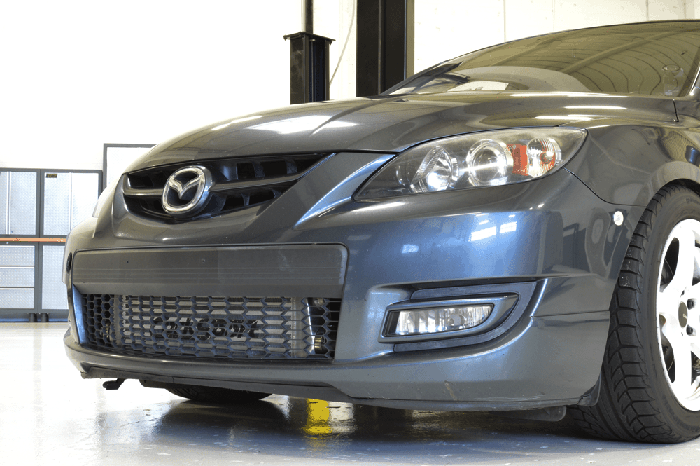 It will take you 6 hours to install the CorkSport Mazdaspeed3 Crashbar with our easy-to-use instructions. Worth the wait!! The instructions really helped out while installing the piping. Had one user error point but one quick call to the guys at CorkSport and it was solved. BAT is at a record low for me (100 degree weather here in Texas). Thanks guys!